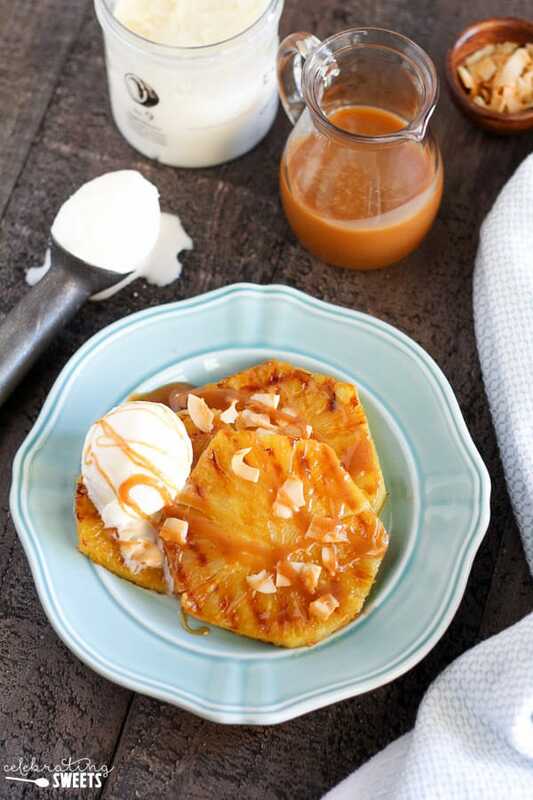 Grilled Pineapple Coconut Sundaes – Juicy grilled pineapple topped with coconut ice cream, caramel sauce, and toasted coconut. 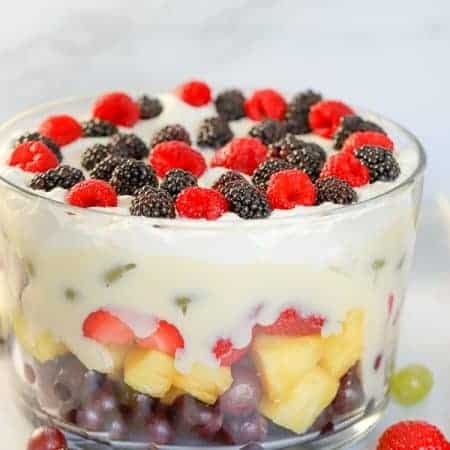 A light and refreshing summer dessert! I present you with the only way you will want to eat pineapple from now until forever: slightly warm, extra juicy, and topped with coconut ice cream and caramel sauce. These tropical flavors will have you momentarily transported to an island where you get to lay on the beach and do nothing. Sigh. Doesn’t that sound glorious? My reality is far from a tropical island. I’m currently trying to convince my children that we do NOT need to go outside into the 117 degrees heat. Yes, you read that right. One. One. Seven. We’re going a little stir crazy here. Pass me more coconut ice cream, stat. So, who likes to grill?!?! Me! Me! Me! Grilling is not just men’s territory. Ladies, you can do this too! We can even grill dessert. YES! The next time you’re throwing chicken, burgers, veggies, etc. on the grill, don’t forget about dessert. Fruit is absolutely delicious grilled. It gets juicy and sweet and it takes on a slightly charred flavor. For this recipe I grilled slices of pineapple. And although you could absolutely eat the pineapple on its own, I took it a step further (when don’t I?) 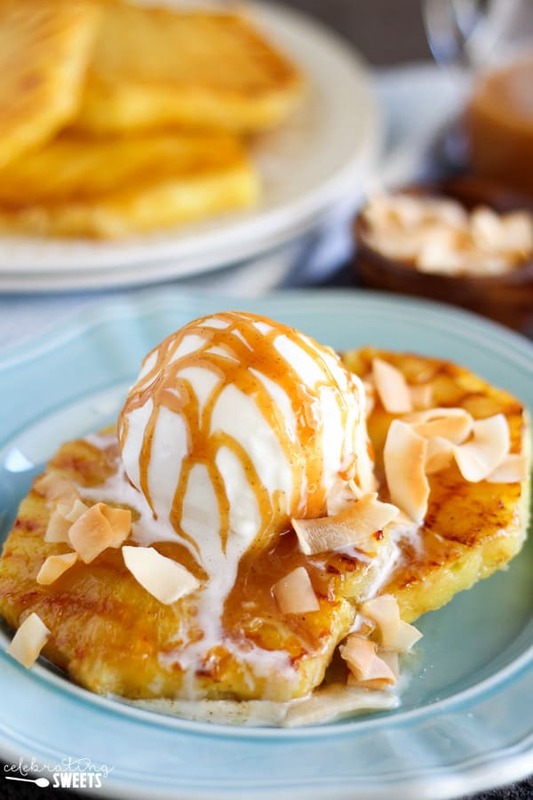 by topping the grilled pineapple with coconut ice cream, caramel sauce, and toasted coconut. I am a huge fan of the contrast of warm and cold in a dessert, so I serve this when the pineapple is still slightly warm, which makes the ice cream get a little melty. 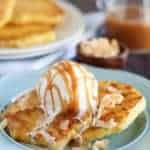 When I came up for the idea for this recipe I was concerned that I wasn’t going to be able to find coconut ice cream, but, I did! And now that I know coconut ice cream is readily available right in the freezer section of my grocery store, I’ll never be without it again. Gah! It’s SO good! If you can’t find coconut ice cream, you can use vanilla ice cream and this will still be super tasty. 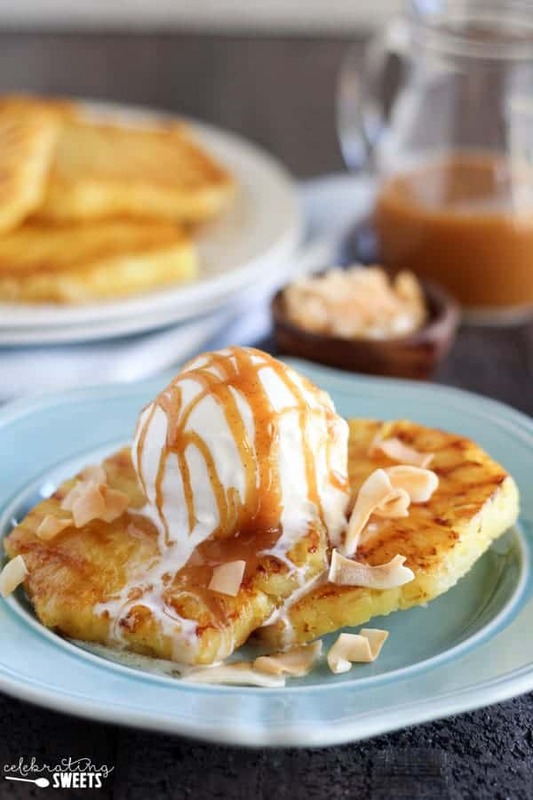 Juicy grilled pineapple topped with coconut ice cream, caramel sauce, and toasted coconut. 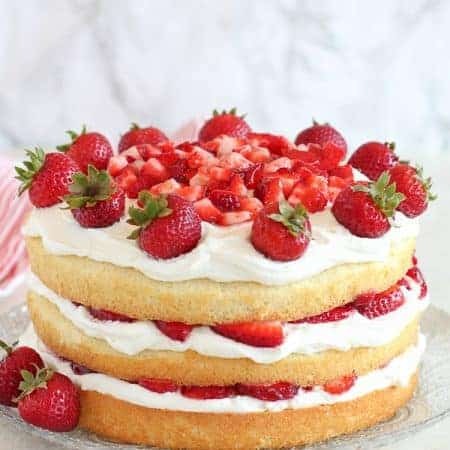 A light and refreshing summer dessert! Cut off the top, bottom, and outer skin of the pineapple (here's a great tutorial) and cut the pineapple widthwise into slices (you should have about 10-12 slices). Place the pineapple slices on a greased grill over medium heat, and cook, flipping once, for about 10 minutes total.The pineapple should have grill marks on it and will have softened slightly. Combine caramel sauce and cinnamon. 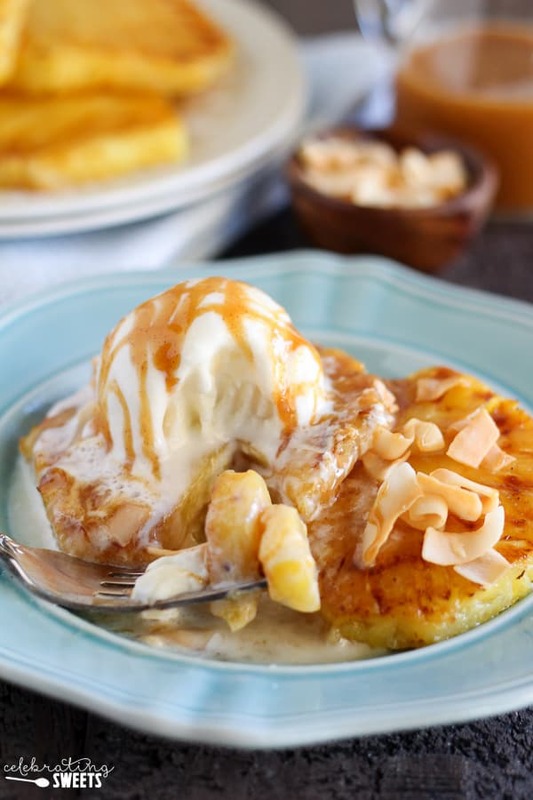 While the pineapple is still slightly warm, top with scoops of coconut ice cream, caramel sauce, and coconut chips. Love to grill? 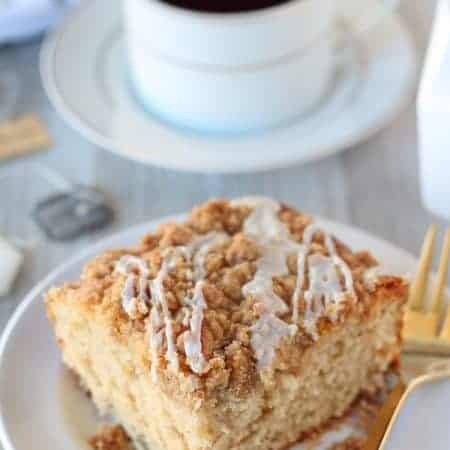 Check out these other delicious recipes from my friends! I love my Mondays because that’s when I spend most time reading blogs. All the creativity, love it! This looks & sounds delicious, I can imagine grilling some pineapple on the barbecue this summer…. Yumm! Looks delicious! I love your photos! I want this NOW…. it looks so yummy. This looks so refreshingly yummy! Perfect for summer! I absolutely LOVE coconut ice cream. New England is known for lots of mom and pop homemade ice cream shops and there are so many choices. I love yours with the grilled pineapple. I’m sorry to hear it’s so hot there. We’ve not had any real heat like you’re experiencing yet, and I hope you get relief soon. Until then…..coconut ice cream! This looks amazing! While it’s not quite as hot in Chicago, it’s still pretty hot + humid. This is perfect for our summer days! It was AMAZING people!! Used vanilla (coconut ice cream would be better I believe) and it was delish! Toasted coconut was key! ThanQ, good stuff!